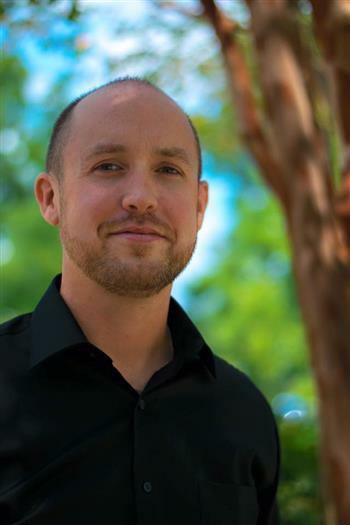 Nationally and Internationally recognized soloist, recitalist, and clinician, Dr. T. Adam Blackstock currently serves as Associate Professor of Percussion Studies at Troy University, and as Principal Timpanist with the Northwest Florida Symphony Orchestra. His duties at Troy University include: teaching private lessons and percussion methods courses, and is the instructor/arranger for the “Sound of the South” marching percussion section. Blackstock also leads the award-winning Troy University Percussion Ensemble, winners of the 2012 and 2015 Percussive Arts Society International Percussion Ensemble Competition. He earned a Doctoral of Musical Arts degree from the University of Kansas, a Master of Arts degree from Tennessee Technological University, and a Bachelor of Arts degree from Newberry College. Blackstock has studied percussion with Joseph Rasmussen and Kevin Bobo, and has studied conducting with Joseph Hermann. In addition to performing recitals and administering clinics throughout the United States, Blackstock has performed internationally as a guest soloist in San Juan, Puerto Rico; Vilnius and Kaunas, Lithuania; Wroclaw, Warsaw, and Kolbuszowa, Poland; and most recently in Prague, Czech Republic and Manchester, England. Blackstock has been featured as a marimba soloist at three Percussive Arts Society International Conventions (2008, 2010, and 2011). He serves the Percussive Arts Society by serving on the Keyboard and Percussion Ensemble Committees, as President (President of the Alabama Chapter of PAS, and he is a reviewer of new literature and recordings for Percussive Notes. Dr. Blackstock is a Black Swamp Percussion Artist Endorser, and an artist/clinician for Innovative Percussion Inc., Remo Inc., SABIAN Cymbals, and Musser marimbas.